I wandered by the Costume Fair yesterday and stumbled (again) upon the shop Curio Obscura. It's a steampunk shop, and when I glanced around their little booth, I was reminded that I've long hungered after these Clockwork Automaton skins. I snagged them, and realized that the skin pack comes with many different colors, all gorgeously detailed. I haven't taken a photo of the skin naked, but believe me, it's as detailed as the head (which was too pretty to cover with hair). Along with the skin, I'm in two lovely costumes. 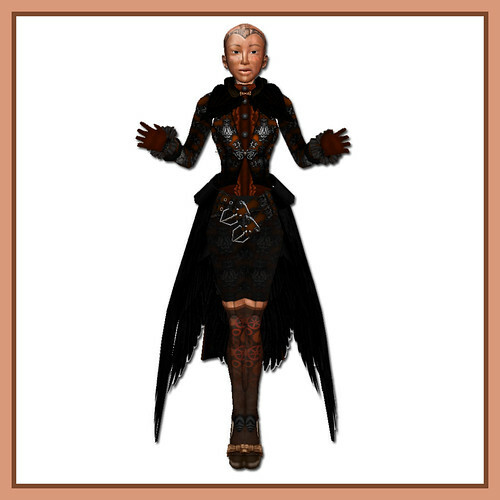 The first is the new ~silentsparrow~ lucky chair outfit, a pumpkin recoloring of the Black Swan Cygne set along with other recolored outfit bits. It comes with many parts, suitable for boys and girls, and is the perfect lush, cosy outfit for my favorite month. 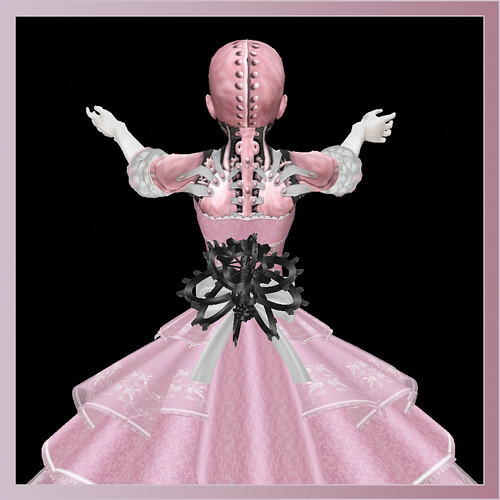 The second isn't a new outfit -- it's katat0nik's creation for the Juicy Bella sim, the princess dress. It suited the skin so well that I had to use it! Oh yay you found pretty stuff to go with it!!! hee hee, i did ! <3 i would've worn the day of the dead dress but i figured gogo would be writing about it. Come blow your horn...wait, that sounds naughty.